Discussion in 'Model S: Battery & Charging' started by wk057, Aug 20, 2014. Note: Updates near bottom of this post. I had originally posted this info/pics in my thread about my off-grid solar project, so, I apologize to the mods for duplicating the info here, but I think it deserves it's own thread in the appropriate section as well. I figure no one would really find it buried in a somewhat unrelated thread. 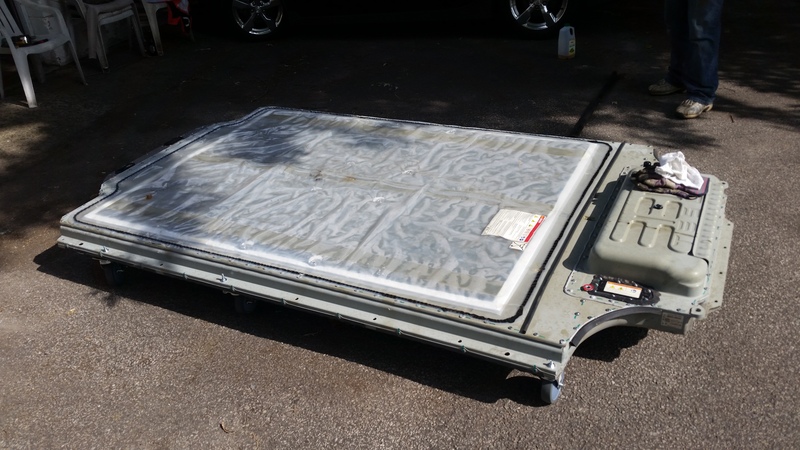 Long story short I purchased an 85 kWh pack from a salvaged Model S for use in a non-EV project (off-grid solar). That aside, I finally got it to where I wanted it yesterday and began working on it. 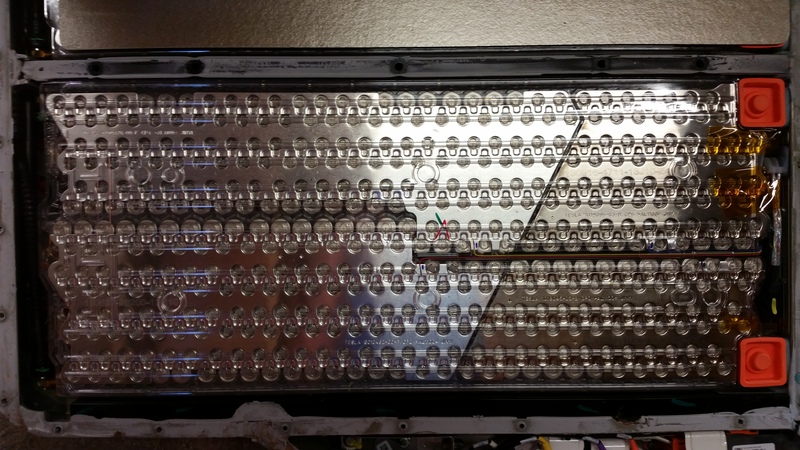 Since I have no way to figure out the low voltage signalling, I had to remove the cover from the pack to get some insight into how I could utilize it. Unfortunately the pack has been sitting for a while (over a month) without being connected to a vehicle. As you can see from the images below the pack voltage is sitting at 313.8V, which is well below where the Model S would drain the pack. However, it's not a lost cause... I doubt one deep discharge will be harmful for my purpose. This comes out to something like 3.2V per cell still, which isn't all that scary yet. I am working on a charging solution. The pack is built like a tank. It appears to be very well thought out and designed very nicely. It is heavy and the framework is very strong. Images I post in this thread and my related commentary are posted and published by me, the original photographer. All copyrights and all other rights reserved. These images may not be copied or otherwise distributed outside of this forum without my express permission. Plastic cover which I later discover has the pack main fuse under it. Label on the center of the pack. Pack after removing the plastic cover which what appears to be some type of fireproofing material under it (between the plastic and pack). The two dents were where some hooks on chains were when the pack was being lowered to the ground by the transport truck. The actual modules are further down under this piece and not affected. Removed all screws from the top of the pack and starting to peel away the top cover. The thing is held on with so much adhesive/sealant that it took us nearly 40 minutes to get to this point. Making progress opening the pack, first couple of modules now visible. I popped a few of the orange HV caps from the one module because I was anxious to get an idea of the pack voltage and module voltage since the pack had been sitting for a while. Top view of the one module. 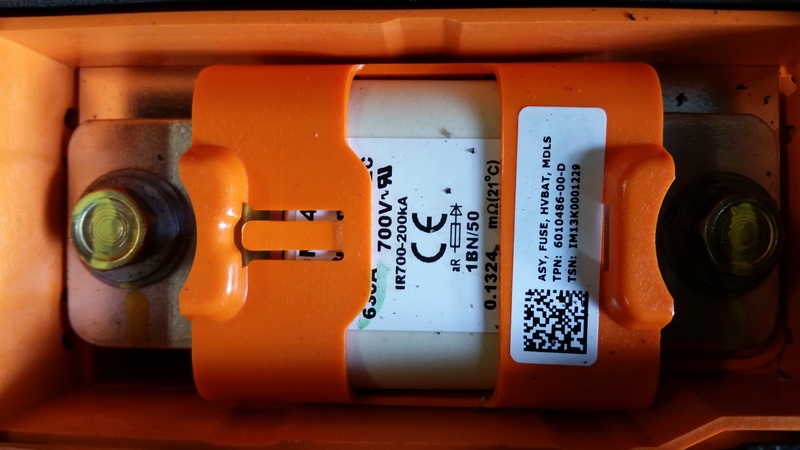 Close up of the pack's main fuse. 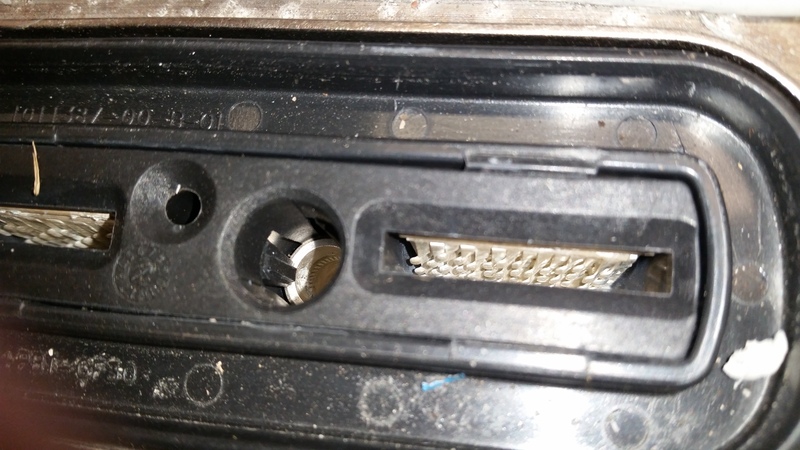 Got the security screws out of the front portion of the pack and removed the metal cover finally, revealing the two front modules which are stacked. View of the front two modules showing the coolant loop quick disconnects. Those are spring loaded and the coolant actually seems to be under pressure. I may work on a way to connect to that to hook up a small radiator and pump later. Close up of some of the cell level fusing. Awesome safety feature here. 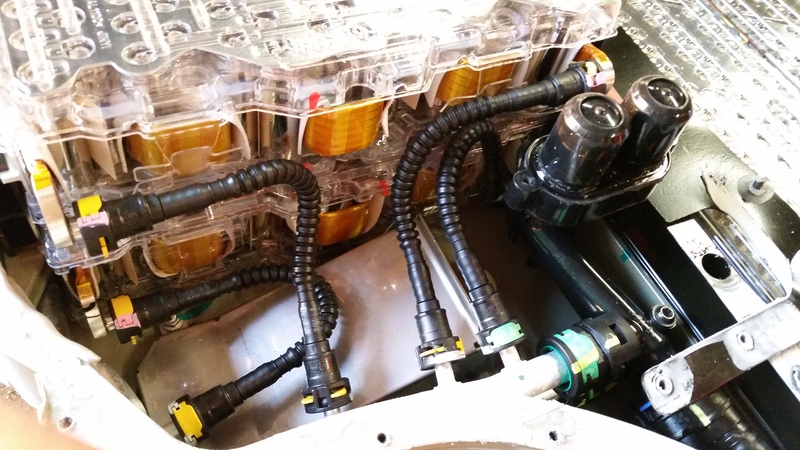 Another shot of the coolant loop connections and front modules. View of most of the pack. Main contactors. One is for positive and one is for negative. 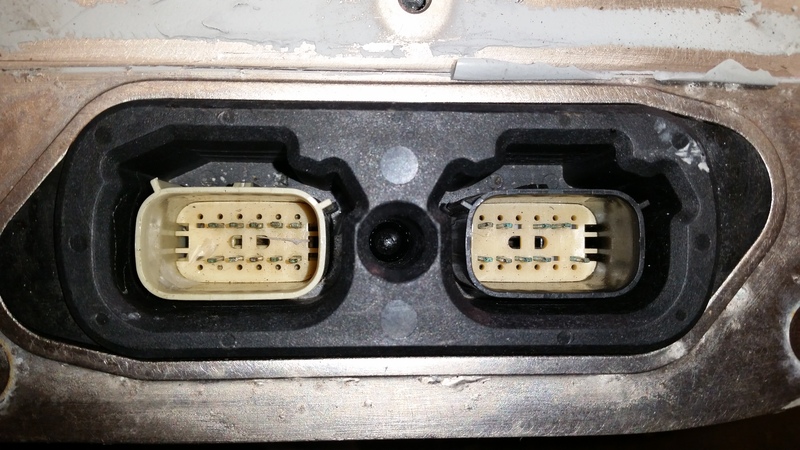 They are connected with bus bars to the pack and to the external connector. There are also small leads (visible on the top) from both sides of the contactors that go to what I would call the main BMS board. View of part of the high voltage bus bars. 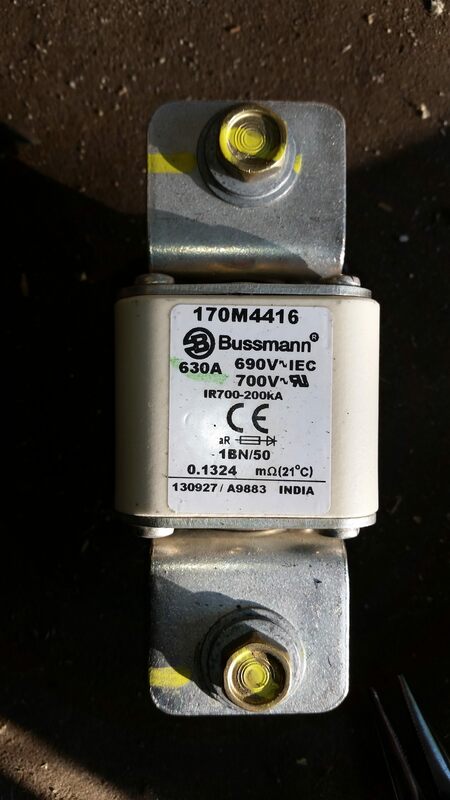 External low voltage connectors, presumable for BMS communication and pack control. 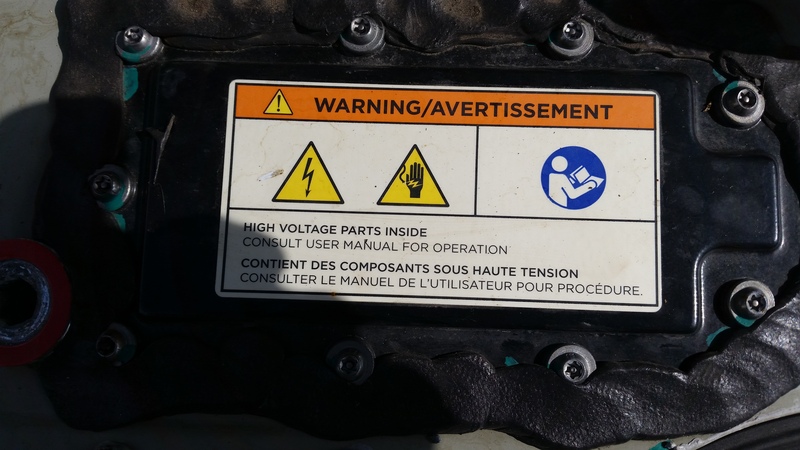 Close up view of the external HV connector showing part of the actual connection that makes contact with the large male blade connector on the car. 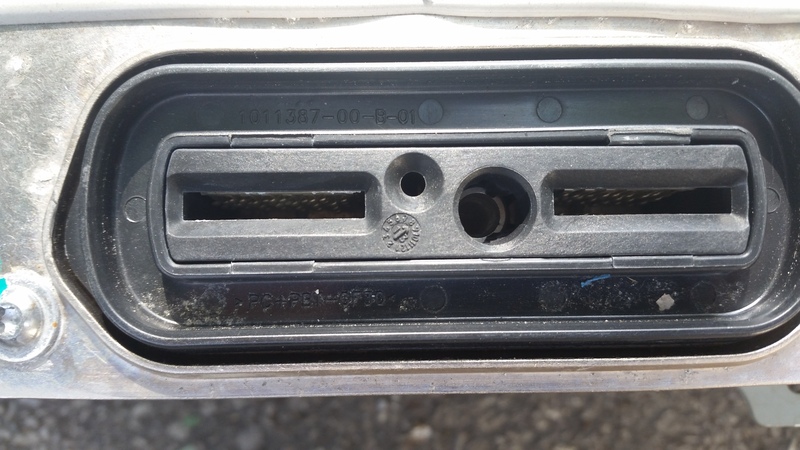 This configuration would likely have very low resistance since it would make uniform contact across the entire connection. Close up of some more cells showing the cell level fuses and the inversion of the next group of cells. One of the pack's contactors. This one is for the negative terminal. 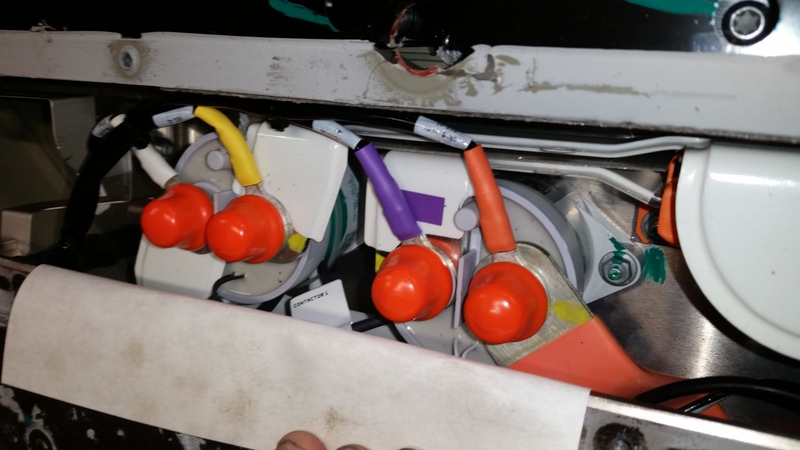 The other is for the positive terminal (not shown) and is a different part number. 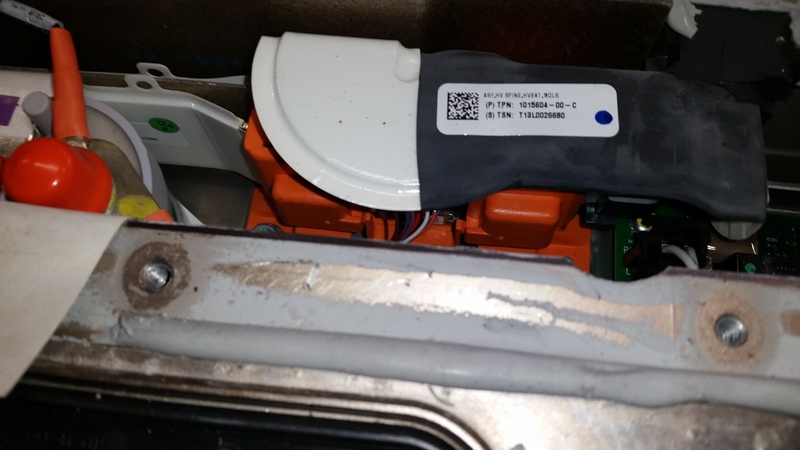 Bottom of the negative contactor showing manufacture as "Tyco Electronics." 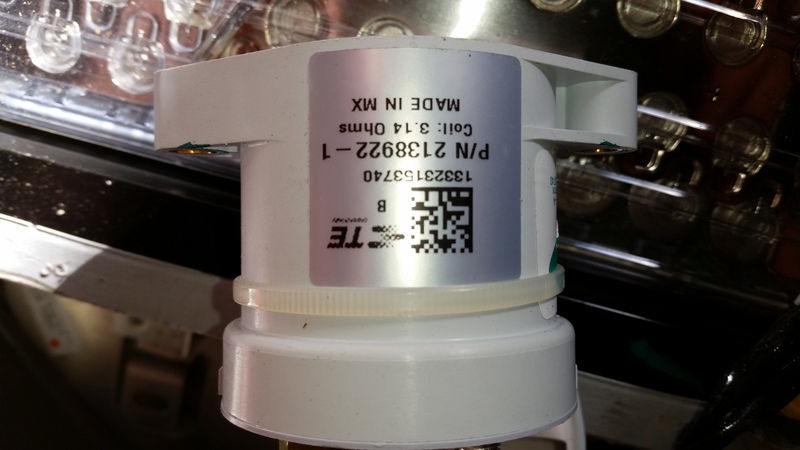 Tesla's part number label for the negative side contactor. 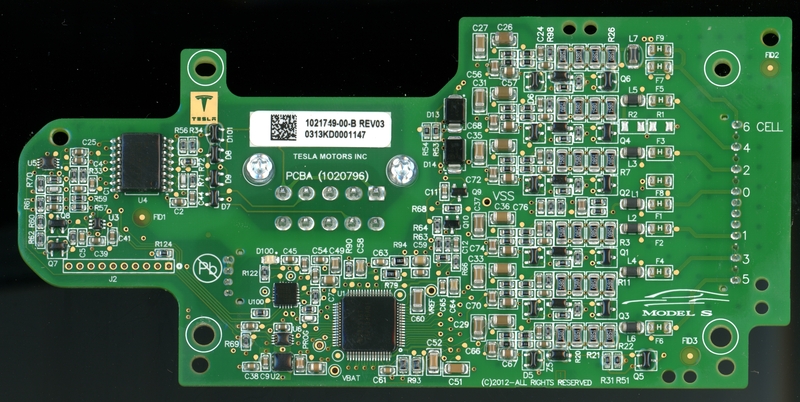 Back of the BMS Module board. 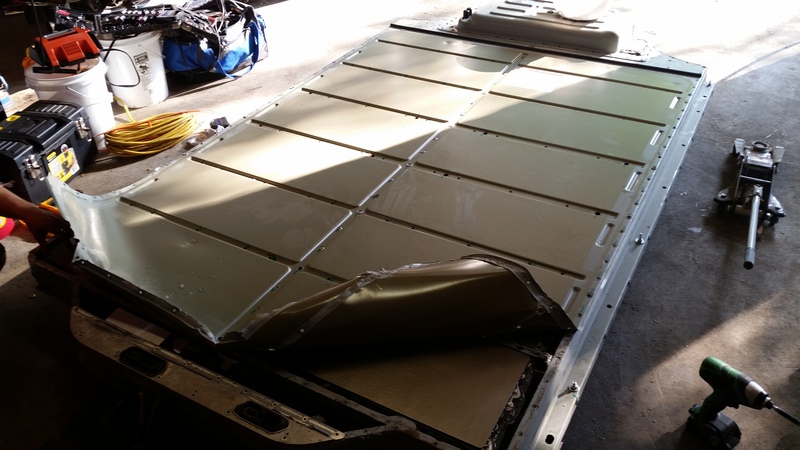 More pics here from full tear down phase! The dang thing is HEAVY. We used several dollies with high weight ratings, chains, rope, a winch, and a few other crazy things to move it, and it took the three of us pushing in unison to get the thing to budge. I did mount some wheels to the sides to try and move it that way, and it worked OK, but I need a way to mount them better. Also... don't try this yourself if you have never done anything with high voltage. It's definitely dangerous and I do not suggest it. My project is not endorsed or condoned by Tesla. Everything I'm doing I'm sure is frowned upon by them and I am doing so at my own risk and hold Tesla harmless with regard to my project. If something bad happens as a result of me messing with this battery pack it has nothing to do with Tesla. 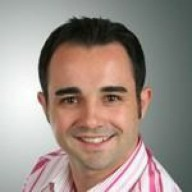 I figured someone would find these pics and comments interesting and/or informative. I will try to take some more as I get to actually doing something with the pack. Update 2014-09-10 --- Added scans of BMS board from a module. Extremely interesting! Please keep us updated! How do you propose to charge?!? 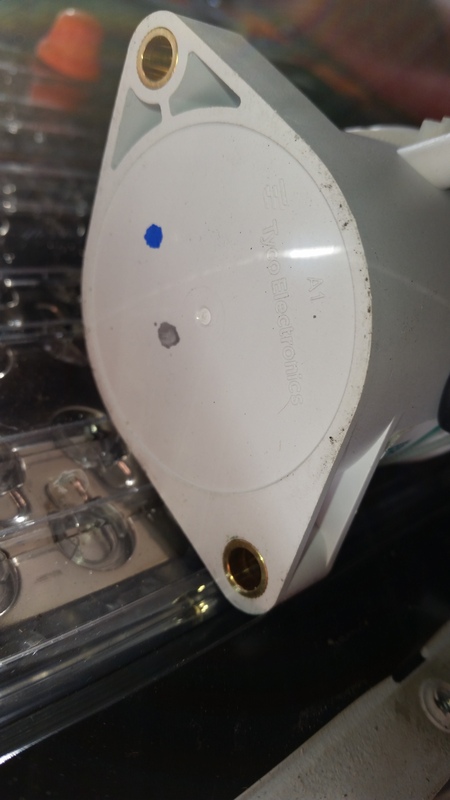 At first will you bypass the BMS and try to just connect it to a higher voltage via the HV connectors tjereby crudely charging it? Or would that likely be impossible due to the design? 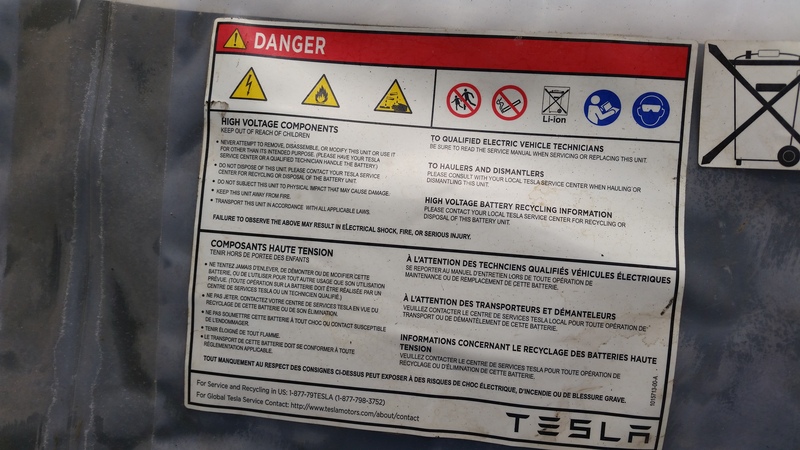 The BMS really doesn't seem involved in the actual charging in the Model S and battery. 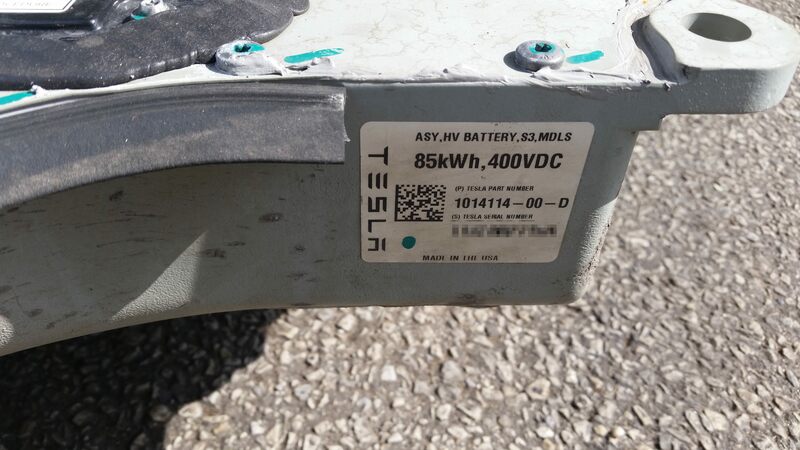 The Model S charger itself, as visible in some photos others have posted, just feeds the battery high voltage to the main connector. The same with supercharging. So, sanely applying a charge voltage to the pack should charge it fine. Thanks for sharing. Is there room for more cells in the pack? Stated differently, could you add additional cells to add more storage? Perhaps increase from 85kwh to a larger size since weight should not be a concern for stationary storage. Just want to second this. There are various things you could touch there that could kill you. I'm not going to pretend to be even close to the expert you seem to be, but I'm 100% certain that the BMS is involved in supercharging. How else does it "manage" the taper curve and determine when to fire up the coolant pumps and when to restrict charging if it gets too hot? Oh no, don't get me wrong. The BMS plays key roles during charging and supercharging in the Model S normally. However, the BMS has no authority, per se, over what is actually done with the power. 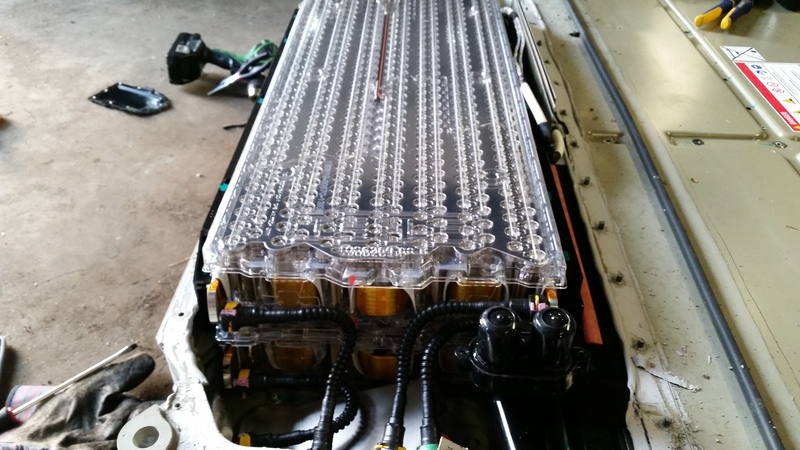 The supercharger just feeds in high voltage high current DC directly to the pack. The BMS monitors the pack to help tell the supercharger how much power to feed. 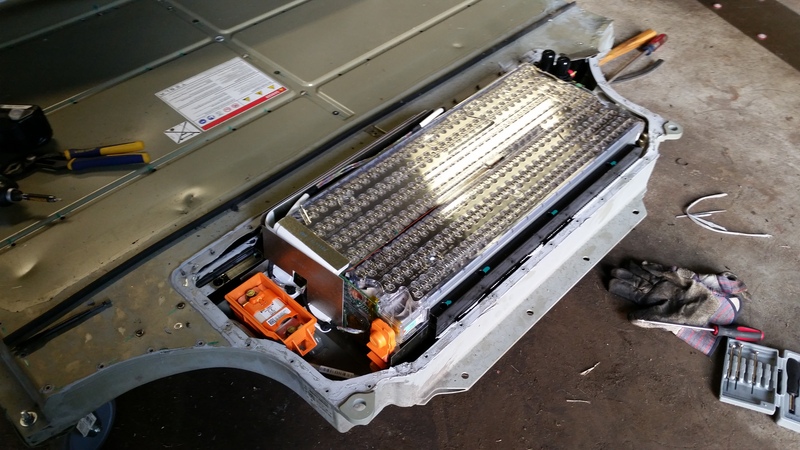 However, from a technical standpoint, with access to the HV endpoint connection it is basically just one big HV battery with no more granularity than that available to the charger. The charger cant choose which cells or modules to charge. It can only charge them all at once. From what I can tell the BMS is only capable of monitoring the modules. They do not seem to have the ability to charge or discharge individual modules or module sections. I could be wrong, but I do not see any connections on the BMS that would facilitate such functionality. They seem to be watch-only. That means the BMS is not able to monitor individual cells to prevent over-charging/-discharging or balance them when required? That doesn't sound like the "world's most advanced BMS" at all. It is definitely able to monitor the 96 module sections individually. You can see the small wires that run from the module sections to the BMS. I'm just not sure what capability the BMS has, if any, to actually manipulate anything with regard to those module sections. Very interesting, thanks for the great pix and sharing your project. Very cool to see the battery pack's entrails. Thanks for sharing. And, stay safe when working with this stuff. 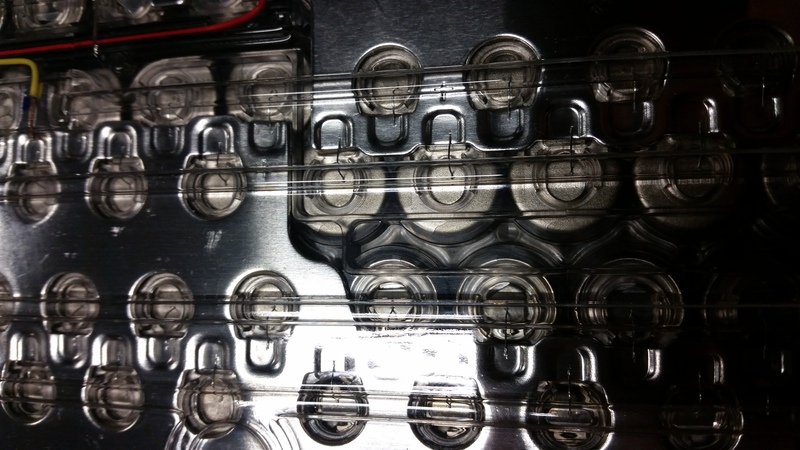 As for physical room inside the pack casing... no, there is virtually no room left in there. Tesla made use of pretty much all available space as was practical with keeping things modular in mind. I still haven't decided if I'm going to break the pack down yet. I've found several off-grid inverters that can be used in parallel to put out up to 80kW AC @ 240V (333A), but with 48 VDC nominal input voltage. That would mean breaking the pack down into groups of 4 modules in parallel instead of one group of 16 modules. I'm still holding on to some hope of finding an inverter that can be used for my project. I may very well have to design and build one from scratch, which would force me to table this project until early next year since I don't have the time to dedicate to that type of design right now, unfortunately. Really great pictures and insights. I like that you compare it to a tank gives me a good feeling driving a MS.
One little thing to note: The serial number you blurred out in the images is also included in the data matrix code next to it. So you might want to blur that as well. You also have more serial numbers and data matrix codes visible on parts of other photos - just in case you want to anonymize the source of the pack here, you could consider blurring these as well. 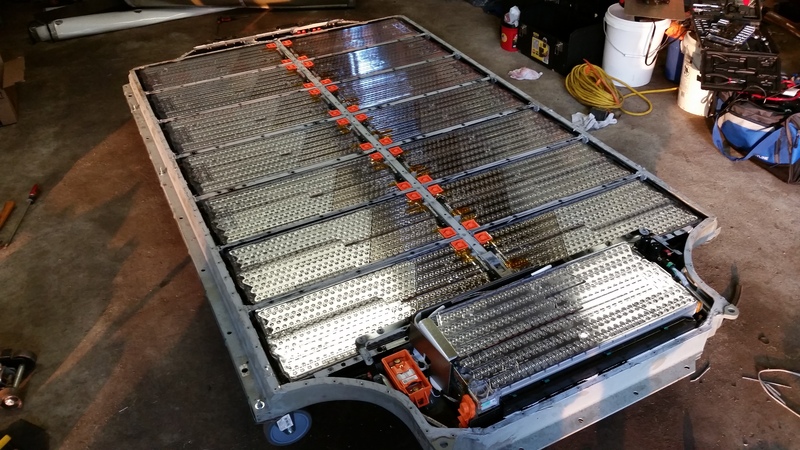 Thank you very much not just for the photos, but for being the vanguard for the battery-bank-from-Tesla crowd. 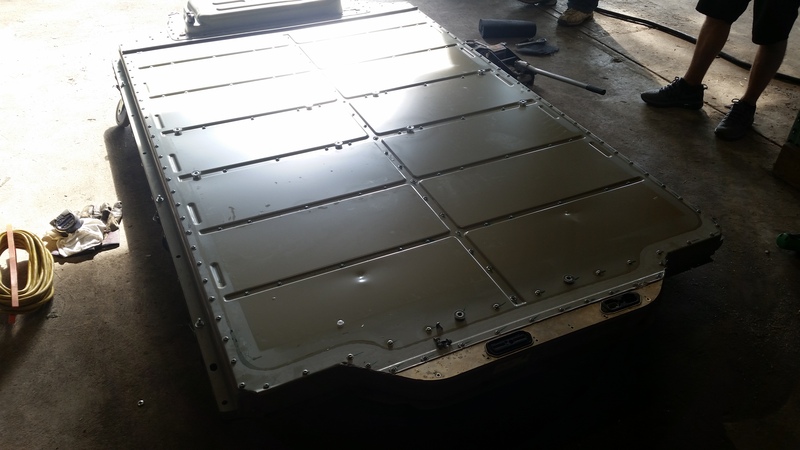 I am very jealous: my own battery bank consists of 9,000 lbs of Absolyte IIP Pb-Ca absorbed glass mat, 1150Ah at 48V. 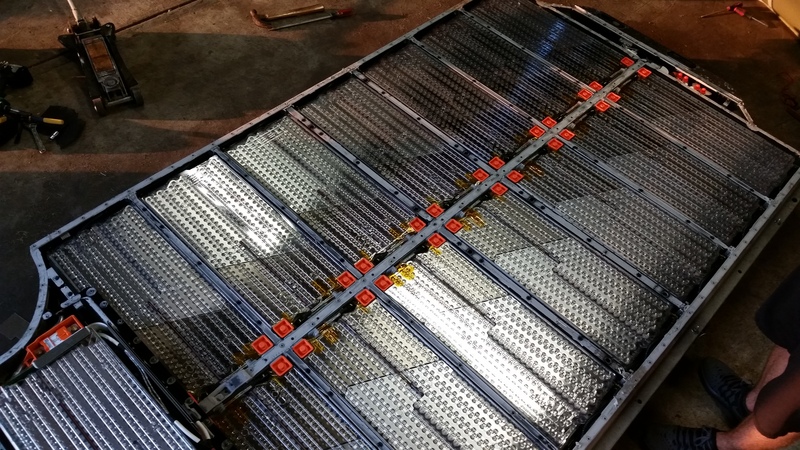 That's 16 550-lb 6V batteries (3*nominal2V each cell). Now, each one of those was heavy, esp. hoisting them on top of each other (2 columns of 8 each. Are you planning to have your system neatly up against a wall? That would be fantastic. But, although my system is better* than yours in one important way...I'd much rather be able to have yours. Far more elegant, far more compact - even if/when you get a second skateboard to mangle. *Better: these Absolytes have extraordinary keeping characteristics in cold weather. That is, -40º and lower. Tesla's system, I have it on unimpeachable authority, are not appropriate for environments far less frigid than that. My bank has endured many days at temps ranging from -30ºF to -50ºF (their first season, seven years ago), and since then I keep them for weeks at a time at temps from 0ºF to about -15ºF. This system is what AT&T and other telecom companies use in remote Alaskan mountaintops; in my more controlled environment it should be good for another 50 years. But back to your system: it's not clear to me what part the coolant bath will play for you. But perhaps my questions should be on your other thread? nice. keep us updated with your progress. Excellent pictures... thanks for posting those. Too bad about the pack not wanting to accept a charge as-is... I suspect unless the BMS is alive to allow it the contractors might not close? So that's an interesting cell layout in each module. 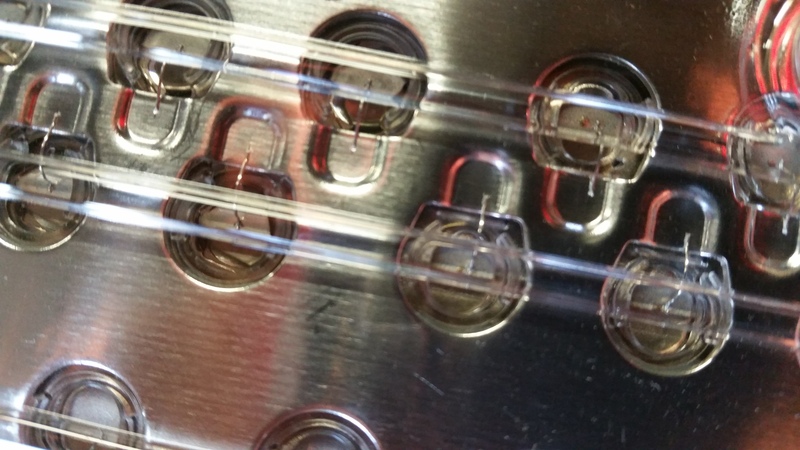 There are four groups of cells in each module, with each group having a common battery contact plate visible on the top. The two larger quadrants each have 148 cells, and the two smaller 74 cells. 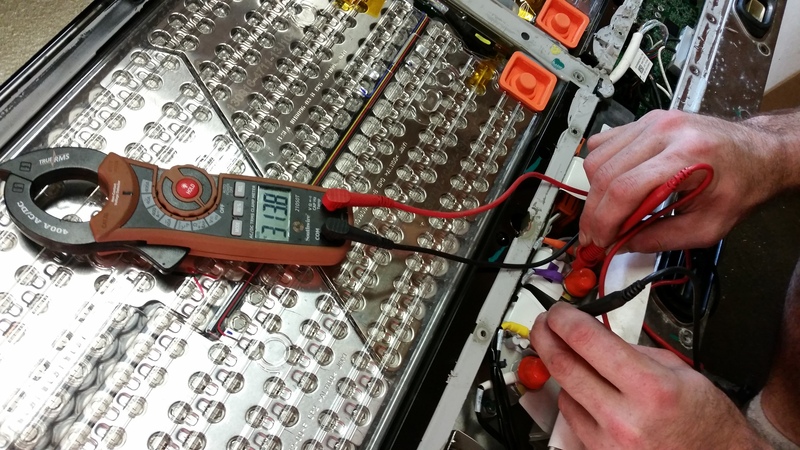 Can you tell if the batteries in the larger groups are oriented with half the cells anode-up, and half cathode-up? That's the only way I can seemingly make the numbers work to come up with a nominal pack voltage of ~390V. With (rouugh numbers) a cell voltage of ~4v, they cant be series groups of 74 or 148 cells per module, as the voltages would be either too high or too low (not to mention that the common battery plates dictate there is a parallel connection in each group). Thus, it appears that the 16 modules in the entire pack must be series connected. 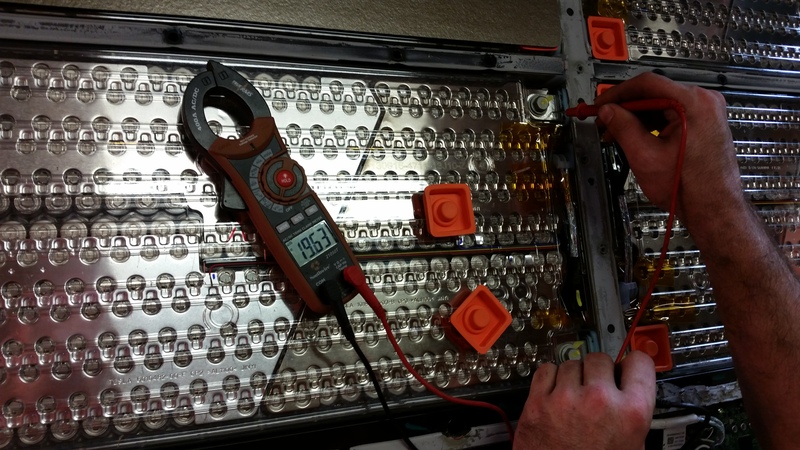 That dictates each cell module must be ~390/16=24V. The only way to get 24 volts out of each module with 4v cells would be to have 6 groups of parallel cell sets connected in series. But there are only 4 visible groups. Given that you would not want unequal groups (so as to keep current capacity even), I'm guessing that each of the larger visible groups is actually two groups of 74 cells, using that common top plate to connect them in series. That means half the cells in those larger groups have to be physically inverted. If so, then I'd guess that those two larger groups have two smaller contact plates on the bottom of each of those larger groups. That allows 6 cells sets in each module at [email protected], which is the neighborhood of the pack rating. Awesome pics and insight. I wish you were out here to help me disassemble my Rav4 EV pack. Here some CAN data from the BMS, et al, that might shed some insight. 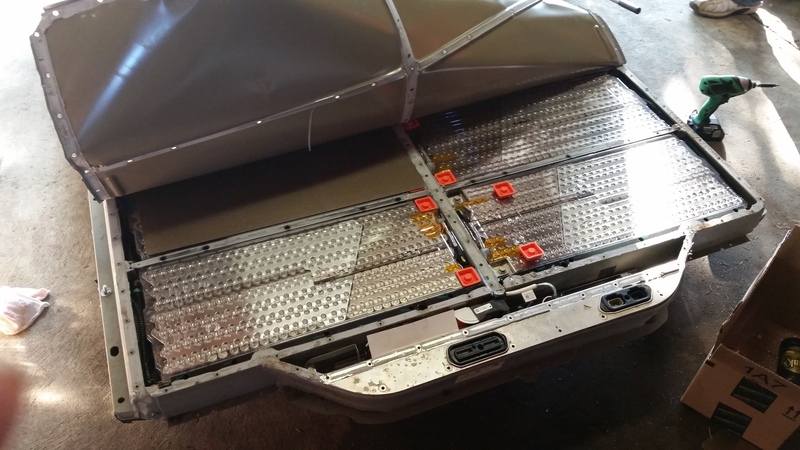 The Rav4 EV pack is almost exactly half the size of the Tesla 85kWh one. Actually, i might be fooled to think it is exactly half, except i think they used 2900ma cells, vice 3100ma. When the car is fully charged, the cells (i don't know if this is individual, or groups of parallel cells) are 4.1 volts. At the "normal" charge of about 80%, the cells are 4.05 volts. This, by the way, is exactly what the Nissan LEAF uses. I drove tonight about 75 miles from Orange County to San Diego. I started around 54% SOC, with cells around 3.7 volts. I drove the car all the way to "Turtle", which occurred at 2.9% SOC. I continued to drive the car to 2.4% SOC, but the battery contactors did not open and i was in my garage. For the 75 miles, the car reported that I used 21.993kWh, and regenerated 889kWh, for a net of 21.104kWh (yes, it actually gives all three values). The cell voltages sagged significantly between 2.8xx volts and 3.2xx volts while driving at this low SOC%, entirely dependent on load. Once in my garage at 2.4% SOC, the cells reported 2.930 volts low to 3.122 volts high under no load. We are compiling all the data as part of our "JdeMO" project, to offer CHAdeMO quick charging to Rav4 EV, Mercedes B-Class ED, and Tesla Model S (no adaptor required!). 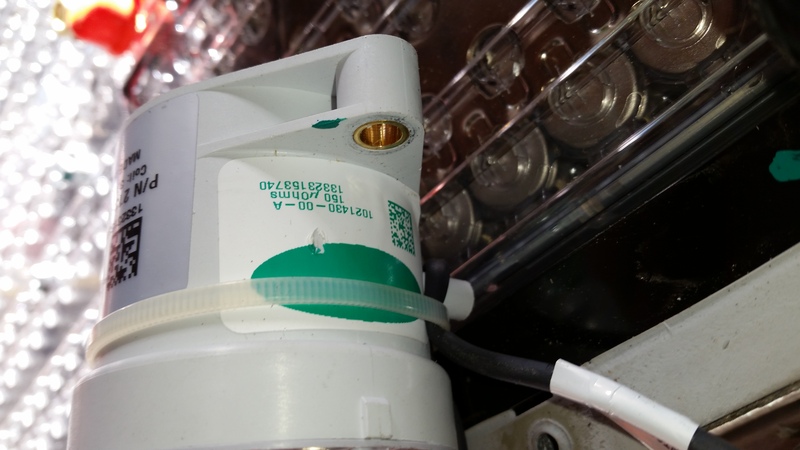 There will be some way for the BMS to bleed off the cells as needed. This will be done continuously during charging, as part of the pack balancing procedure. As the cells are probably very well matched, they may not need to bleed off much energy, so the load dump resistors may be quite small. Is there any chance that if you take the pack to bits, you could get a photo of the BMS board for us? That would be very interesting.